Never Yet Melted » How To Save a Liberal Court? Kale, Gay Bodyguards, Maybe Vampirism…? How To Save a Liberal Court? Kale, Gay Bodyguards, Maybe Vampirism…? 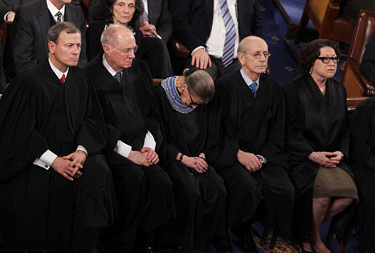 Ruth Bader Ginsburg nods off during event. SFGate reports that lefties are panicking. Trump’s first Supreme Court appointment will be nearly impossible to oppose succcessfully, and Ruth Bader Ginsburg is 83 and a survivor of two forms of cancer. Gorsuch on the Court restores the 4 liberals, 4 conservatives, and Anthony Kennedy who can go either way status quo prevailing prior to the death of Antonin Scalia. One more conservative and Roe v. Wade might be in trouble. On Tuesday evening, President Donald Trump nominated Neil Gorsuch for deceased Supreme Court Justice Antonin Scalia’s long-empty seat. On Wednesday morning, liberals woke up, did the math and realized it was time to be concerned about Ruth Bader Ginsburg’s fiber intake. Also bone density. Also exposure to airborne viruses (Madame Justice, what is your flu shot status? ), and salmonella, and slippery ice, and also: Has anyone heard how scientists are coming along with a Zika vaccine? “Can she eat more kale?” asks Kim Landsbergen, a forest ecologist in Ohio. “Eat more kale, that’s all I can say. We love you. Eat more kale. 3 Feedbacks on "How To Save a Liberal Court? Kale, Gay Bodyguards, Maybe Vampirism…?" It is wrong to allow here to “hang on” and make critical decisions that affect millions of citizens. Would we allow her to fly a passenger plane full of travelers if she had been a pilot instead of a judge? Why then allow her to make critical judgements as a judge? Millions of liberals that never before prayed in their lousy lives are praying that Justice Ginsberg doesn’t drop dead. I’m still waiting for her to move out of the country like she promised if Trump won.